Nicknames "El Grandote de Salvatierra", "El Más Rudo"
MS-1 is one of those forgotten wrestlers that most modern fans could never see a lot of because he retired too early. He was a great brawler, a very good technician, a hell of a bumper, plus he had a great understanding of wrestling psychology and what makes a match work. He definitely is one of the most underrated luchadores of the last 20 years. Pablo debuted at age 21 under his real name, Pablo Fuentes, on July 12, 1978. He was a really promising rookie so in less than a year EMLL picked him up and gave him a new name and a mask. In March 1979 he debuted as MS-1, teaming regularly with MS-2. He was much better than his team partner so he was pushed in singles competition while MS-2 disappeared. His gimmick name actually has a meaning. In Mexico, MS is a special police unit to keep terrorism under control. The highest ranked person in the group is MS-1. He had a singles feud with Rayo de Jalisco Jr. and lost his mask to him on July 2, 1982 at Arena México. This was a good thing for him, as his mask and outfit were really ugly, plus he had a great "lady killer" look. He then feuded with Sangre Chicana, who was one of the main guys in EMLL at the time, and on September of 1983 they had an excellent hair vs. hair match: a great, heated, bloody Arena México brawl with MS-1 finally losing his hair. 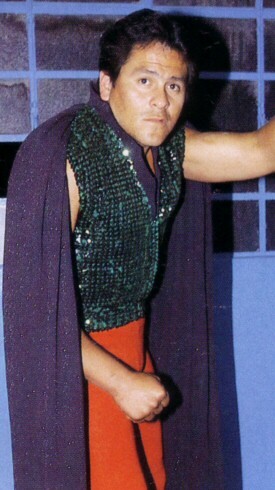 In 1984 he formed the original Los Infernales with Espectro Jr. and Satánico (who was another of EMLL's main guys). There was a "trios" boom in Mexico, mostly thanks to the success of Los Misioneros of El Toreo, so EMLL tried to have it's own team comprised of three awesome rudos that could wrestle any style. MS-1 and Satánico always stayed on the team but Espectro Jr. was substituted by Pirata Morgan to form the best, most popular and most successful version of the team. On February 12, 1985, MS-1 beat Ringo Mendoza to win the NWA World Light Heavyweight Title in Acapulco, Gro., and lost it on June 21 against his old enemy Rayo Jr. at Arena México. He beat Rayo for the title at the same place on March 20, 1987. And he lost it three months later, on June 24, against Cien Caras in Nezahualcoyotl. The 15th of March, 1985, Los Infernales became the first National Trios Champions after defeating Los Brazos at Arena Coliseo. The Brazos/Infernales teams had awesome chemistry together and delivered several excellent title matches during the years. The same Brazos defeated them on December 8, also at Arena Coliseo, to win the titles. On October 86, Pirata Morgan left the team to form Los Bucaneros with his brothers, so Masakre became the new member of the trio. He and MS-1 held the National Tag Team Titles once as they defeated Los Hermanos Dinamita (Cien Caras & Máscara Año 2000) on March 26, 1987. They lost the titles to the tecnicos Atlantis and Angel Azteca, on April 6, 1988, holding the titles during a year and a few days. Satánico was getting a singles push, and Masakre and MS-1 broke up so the Infernales were no more after that. Masakre and MS-1 actually feuded and had a big hair vs. hair match on June (two months after they lost the tag titles) which MS-1 won. In the early 90s the Infernales reformed with Pirata as the third man again, and they became the first ever CMLL Trios champions ever after defeating Los Brazos in a tournament final (November 22, 1991). Masakre now had his own team, Los Intocables (The Untouchables) with Pierroth and Jaque Mate, and they feuded with Los Infernales over the straps. Many lucha fans remember this one as one of the coolest rudos vs. rudos feuds ever, maybe not for the level of the matches, but for the dramatic and violent brawls between them. Intocables defeated Infernales for the titles once, but MS-1's team regained them. They also feuded with Los Brazos who took the titles from them as well. From 1992 to 1994, Brazos and Infernales had even more great matches, some of them were pure lucha and were rated on the ****1/2-3/4 range by many fans (including myself) and "sheet" writers. The Infernales team kept together during the first half of the 90s except for the months in which Satanico and/or Pirata Morgan were wrestling for AAA. MS-1 always stayed in EMLL, though. They kept teaming until early 1996 when MS-1 left the company. He became a promoter at some small arenas in Naucalpan and formed a new Infernales team with MS-1 Jr. (his son) and a MS-2 that would be a local that changed depending of the place they wrestled at. Soon after that, MS-1 silently disappeared from the lucha scene, and nothing has been heard of him in quite a few years now. Turned up in AAA in 2006 as, Mungo, a member of Alliens stable Los Alienegenas that also includes Kriptor and their mini snail-like monster Mandrox that is fueding with Alebrije and Cuije. This page was last edited on 15 June 2017, at 20:01.